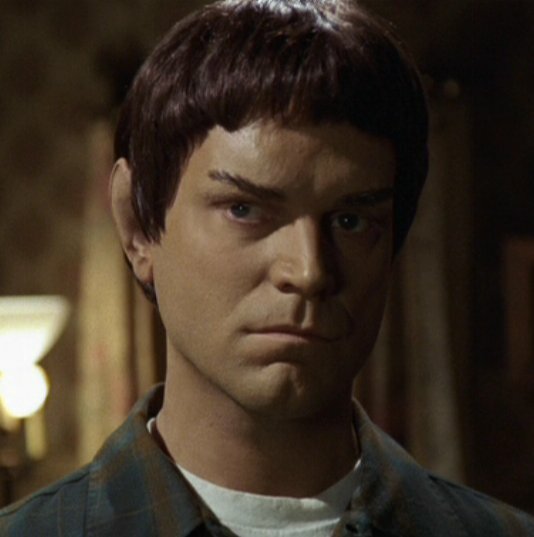 Physical Description Volok looks like a typical Vulcan, an average build humanoid male with pointy ears and a dull haircut. His superior strength, like any Vulcan three times that of a normal human, has worked in his advantage more often than not. His dark green eyes can look right through you, but you'll have to be severely on his bad side to get a stare like that. Usually he wears just regular clothing, but he has a terrible sense of fashion so some odd colour schemes are not uncommon. General Overview For a Vulcan, Volok might be considered an easy going person, may be due to a small part human in his genes. He's not the one to cause any trouble, but if the need arises, he's the one to finish it. His pacifist nature has suffered a blow with the loss of his long-time companion and wife due to a Cardassian raid on their settlement on a planet populated by Federation colonists in the DMZ near the Cardassian border. His mind, capable of very logic reasoning, has found a way to deal with the emotions which have been much closer to the surface since the biggest tragedy of his life. Personal History Volok was born on Vulcan on February 9th, 2317 to Salmek and T'Dol. It was a happy day for the couple, but since happiness is considered an emotion, Salmek used the words "It's a day to remember!". A keen observer may have seen a faint smile appear on the otherwise so stoic Vulcan's face that could be interpreted as an outburst of joy. His father was and still is a highly acclaimed philosopher among the scholars of Vulcan logic, which was considered a great accomplishment for oen who was half Vulcan and half human. His mother was a teacher at the Vulcan Science Academy. After Volok's birth he became her first priority. Due to his mother's attention he came into contact with several fields of science at a young age. Between learning primary logic from playing with pleenoks and lectures from his father he found the time to ask his mother a lot of questions. She answered each question the best she could, but a sense of peace came over her when he finally entered the Vulcan equivalent of elementary school around 2322. That is where a little Vulcan girl named T'Ini seemed the smartest of the class, something Volok found very interesting. They got along great and spent a lot of time together. Some, in the eyes of Volok, "logical inferior classmates" were teasing them, as if they were already destined to be bonded. But both their parents had come to an agreement to have them joined telepathically at the age of seven. Through school and the Vulcan Science Academy they stayed in touch, often discussing and debating about various topics of their study in their off time. Volok applied for and was accepted into Starfleet Academy after finishing the exams almost flawlessly. From his study in science and xenobiology at the Vulcan Science Academy his interest was drawn towards medicine. He completed Starfleet Academy in the established four years majoring in medicine and completed his medical studies at Starfleet Medical in four years after that, gaining his full medical degree in 2350, graduating at the rank of Lieutenant junior grade. He was assigned to the USS Strata as a medical officer, but after the then assistant CMO died in a tragic accident on an away mission in 2353, he got promoted to that position. The fact that he completed his duties to the best to his abilities and if necessary, even beyond that, didn't go unnoticed with Starfleet. He got promoted to Lieutenant and was assigned to the USS Xanadu but now in the position of Chief Medical Officer. During his seven year run on the Xanadu he found the time to complete the Bridge Officer's Test in order to broaden his future possibilities. The series of tests formed no real problem for the logical minded Vulcan, because for every problem there was a logical solution is his mind, although it seems harsh to some to be able to send someone to a certain death in order to save the rest. In 2362 he got the opportunity to lead the medical facility on Soltok IV, a world in Cardassian or Federation space, depending which side you're on. On the recently established colony was need for medical care and for Volok the opportunity to apply all his knowledge he gained in medicine with the minimum amount of resources, so called frontier medicine. With the scientific opportunities in the surrounding planets in the Soltok system, a year later the facilities were expanded with a scientific department. Since T'Ini was the lead researcher of the newly added scientific branch, both were reunited on Soltok IV. In the years that followed the tension between Cardassia and the Federation over control of the planets and systems around the border grew again. Suspicion of spying activities by the Federation scientific researchers on worlds claimed by the Cardassian military government led to harassment of Federation science vessels by Cardassian warships. In the meantime the colonist's rebellion rose in strength in the region, with violent acts against their 'Cardassian oppressor'. Starfleet responded by sending a starship with a diplomatic mission to convince the Cardassians of their non-hostile research, but also to keep an eye on things, to avoid an outbreak of violence. But after the starship had been dispatched to a different sector, one Cardassian Gul saw an opportunity to be done with the Federation activities in the Soltok system and launched an attack on the Federation science vessel assigned to Soltok IV. The ship was obliterated by the unprovoked attack and lost with all hands. Commander of the vessel was T'Ini, Volok's mate. On learning the news he was devastated, almost ceased to function. His Vulcan mind couldn't rationalize the Cardassian act and the more he tried to, the more he started to give in to his emotions culminating in a violent outburst. When he regained composure he was ordered to take an extended leave of absence from Starfleet in order to get his facts straight again and to try to deal with his enormous loss. During his leave he got approached by a group that called themselves the Maquis. They were in need of medical assistance and were adamant they would not get any help from the Federation. Their goal was to end the Cardassian threat by any means necessary. It was the first time Volok heard the name of the rebellion organization, but their goal was interesting. He agreed to provide the necessary medical support needed and resigned from Starfleet so his actions would go unnoticed. For the next three years he provided the medical care needed to the Maquis. While he attended to a wounded rebel, a Federation raid arrested most of the cell present on the planet along with Volok. No questions asked he was set on a transport vessel bound for Earth to stand trial for collaboration and treason. Since there was no evidence that could link Volok to any Maquis activity other than the medical care he provided the moment the Maquis cell was arrested the charges were dropped. True to his own defense, he merely acted upon his medical oath to help those in need. With the Dominion War going on in full force he applied for a return to Starfleet and was accepted back after a full debriefing and returned to his former line of work as Chief Medical Officer aboard the USS Isoroku. During the remainder of the War the ship took part in several missions in order to turn events into the favour of the Allies which by the end of 2375 led to the end of the War. After the war ended he remained aboard the USS Isoroku which was now assigned mostly relief missions to rebuild the Federation after the devastating war. For years it had been all work and no play for Volok. This focus on his career gave him the opportunity to become Chief Medical Officer aboard a Galaxy class starship, the USS Gemini with a promotion to the rank of Commander. The Gemini's missions took it to all corners of Federation space, but with the events of the Hobus Supernova in 2387 the efforts geared toward relief missions again in the vicinity of the Romulan border. A line of work all too familiar to Volok. He had seen his share of grief and despair over his long career in the medical field. Now the grief and despair grew closer to home. He received a message that his father had been diagnosed with an aggressive variant of Tuvan Syndrome. His mother, at the age of 112, was also feeling the effects of her age. Since it had been years he spent quality time with his parents, Volok took an extended leave of absence to reconnect with his parents. Being back on his homeworld and taking care of his parents instead of an entire ship and crew had a strange effect on Volok. His focus which had kept his career on track shifted and seemed not all important any more. His logical conclusion was that he would not be able to commit fully to his job, so that he would not be able to fulfil that to the level needed. The proper action in his mind was to resign from Starfleet, leaving his CO stunned but understanding. 2362-2369 - Starfleet Medical - chief of the main medical facility on Soltok IV, promoted to Lt.Cmdr. 2374-2381 - USS Isoroku - Chief Medical Officer, reinstated as Lt.Cmdr.